"I'm just trying to look after my family…" Film4 out of the UK has debuted another official trailer for the generational crime drama Trespass Against Us, about a family of criminals who end up battling against each other. The indie film stars Michael Fassbender as a man trying desperately to escape the dangerous criminal world presided over by his savage father, played by Brendan Gleeson. The cast also includes Rory Kinnear, Sean Harris, Lyndsey Marshal, Killian Scott and Georgie Smith. This also features a score by The Chemical Brothers, some of which can be heard in the trailer. It seems like a solid crime thriller with some intense dramatic scenes and entertaining action, but it's oddly being released very quietly later this month by A24 in the US (see the US trailer here), which makes me a bit concerned. Have a look. Set across three generations of the Cutler family who live as outlaws in their own anarchic corner of Britain's richest countryside. Chad Cutler (Fassbender) is heir apparent to his bruising criminal father, Colby (Gleeson) and has been groomed to spend his life hunting, thieving and tormenting the police. But with his own son, Tyson (Smith) coming of age, Chad soon finds himself locked in a battle with his father for the future of his young family. When Colby learns of Chad's dreams for another life he sets out to tie his son and grandson into the archaic order that has bound the Cutler family for generations. He engineers a spectacular piece of criminal business involving a heist, a high-speed car chase and a manhunt, which leaves Chad bruised and bloodied and with his very freedom at stake. Trespass Against Us is directed by filmmaker Adam Smith making his feature debut, from a screenplay written by Alastair Siddons. The film premiered at the Toronto Film Festival. 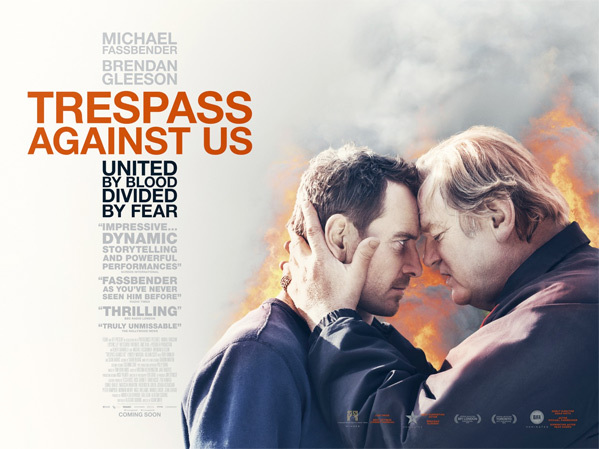 A24 releases Trespass Against Us in select theaters January 20th. Looks great. Soundtrack will be killer for sure. Fassbender is always great(even in AC),but those mixture of accents...I know he speak freely several languages,but,boy...Anyway,Gleeson is always a giant in my eyes,so,will watch it.